Boise, Idaho-based truck driver David Rivera said he hasn’t seen anything like it in his nine years on the road. Earlier in the day, Rivera had stopped at the Topeka office to pick up cleaning buckets. Meanwhile at the Wichita office, as many as 50 volunteers at a time formed bucket brigades to haul the cleaning kits onto the truck, lit by a set of pickup headlights. A different truck was loaded a day earlier in the Lincoln office. All told, the Great Plains Conference loaded 5,176 cleaning buckets bound for the United Methodist Committee on Relief Sager Brown Depot in Baldwin, Louisiana. Three weeks earlier, when Bishop Ruben Saenz Jr. challenged the conference to assemble 5,000 buckets – an average of about five by each church – the greatest need was in Texas and Louisiana for people who had been hit by Hurricane Harvey. But since then, the conference has been told that the area has been saturated with buckets and that the need now was in Florida, for those in the path of Hurricane Irma. 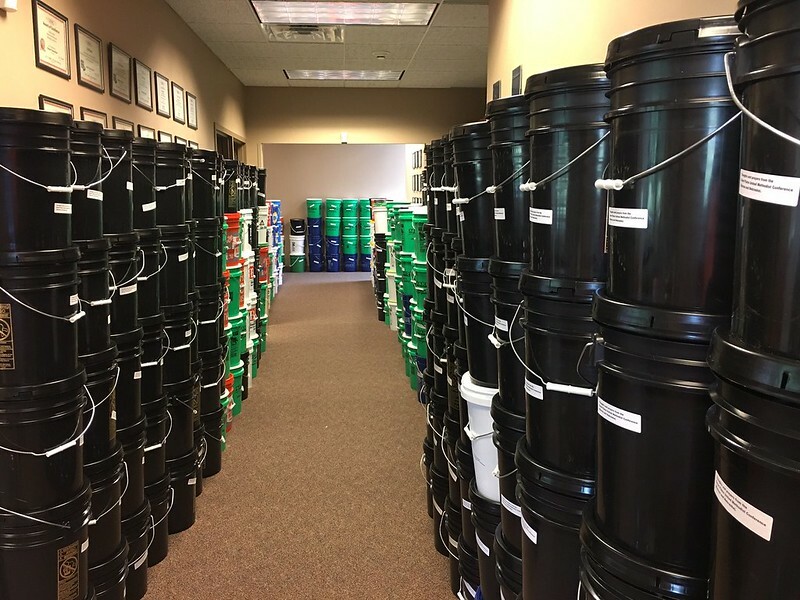 Although the truck was packed, 750 buckets remain in the hallways of the Wichita office. Another truck with more than 100 cleaning kits broke down on its way to Wichita. Each of the three conference offices heard heartwarming stories about people gathering buckets and people with vehicles packed to capacity delivering them. The Rev. Hollie Tapley, disaster response coordinator for the conference, heard the bishop’s challenge for the first time on camera while they were taping a video for the Great Plains. However, “People were up to the task,” Tapley added. Off camera, the bishop challenged the district superintendents to assemble 300 in each of their 17 districts. “They took hold of it, and it was just beyond our imaginations,” Tapley said. Although the cleaning buckets were a tangible measure of assistance, monetary contributions flowed in as well. Niki Buesing, conference controller, said the conference took in $54,696.59 for UMCOR disaster response and another $9,347.41 for UMCOR to purchase supplies. An addition $916.50 was raised for Great Plains Conference disaster response. Tapley said she has heard countless stories about schools, Wesley Foundations and Girl Scout troops participating. She also heard of several pastors who would perform stunts – from one getting a bucket of water dumped over his head to a female pastor who gave her sermon in a green wig and gaudy, glittery red dress – if congregations reached their goals. Nebraska Wesleyan students assembled more than 40 buckets. And local media from newspapers in Grand Island to television stations in Wichita took notice of the efforts of individual churches. “People took it to heart and made it fun,” she said. She also has heard stories about businesses and communities getting behind the goal. Although churches closest to the conference offices had fewer miles and more time to make deliveries, that didn’t stop those in the far reaches of the conference. Case in point is First United Methodist Church in Scottsbluff, Nebraska, which loaded 110 buckets onto a horse trailer to make the more than six-hour drive to Lincoln. Business manager Raylene Gies said church members were given the option of filling their own buckets or donating the money for the supplies. The Rev. Craig Collins and a group of church women went to businesses later to buy the contents. The church’s youth group helped pack during their weekly meeting. Scottsbluff’s Home Depot donated buckets, as did a local hardware store. A local bookshop donated the lids. Tapley said she’s heard many other stories about communities banding behind the project. “It’s been amazing how the story has gone into the community,” she said. As people would purchase supplies, workers would ask about their project, giving United Methodists a chance to share about their church. But as anyone who has been watching the weather knows, Harvey and Irma are likely not the end of the hurricane story for this season. Contact David Burke, conference communications coordinator, at dburke@greatplainsumc.org.